After a September drop-off, Hyundai Motor America rebounded with its best October sales month in company history led by the new 2014 model of the Montgomery-made Sonata. There were nearly 20,000 Sonatas sold in October, about 5,000 more than the Elantra. It’s the first time since January that the Elantra, which also is made at Hyundai Motor Manufacturing Alabama, hasn’t been the company’s top seller. Overall, the company sold 53,555 vehicles in North America last month, up 7 percent over October 2012. HMA said the nation’s political issues may have contributed to an 8 percent year-over-year drop in September. Now, that could be turning around. The company said sales were especially strong in the final two weeks of October, after the federal government went back to work. “October was a bit of a roller coaster ride for the entire automotive sector, so we feel pretty good about exceeding prior year sales results and posting our best-ever October performance,” HMA executive vice president of national sales Dave Zuchowski said in a statement. 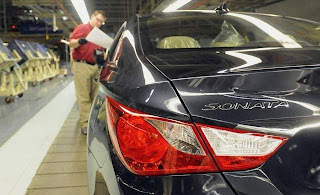 The Montgomery plant shifted its production mix last month to focus on the rollout of the new Sonata. While final production numbers were not immediately available, HMMA spokesman Robert Burns said the plant planned to build 61 percent Sonatas and 39 percent Elantras in October. Sonata sales had fallen this year as workers here focused on building the hot-selling Elantra through the summer, a change that HMA said led to a thin Sonata supply at dealerships. The company plans to debut its 2014 Elantralineup at the Los Angeles Auto Show later this month. Burns said he expects that model change to lead to another shift in production mix at the Montgomery plant by December.